Deeply Healing, Yin Yoga workshop. In this 2 hour workshop we will move through a healing combination of Yin Yoga poses that will leave you feeling calm, balanced and refreshed. We will focus on seated and reclining poses throughout the workshop, offering a natural balance to the “Yang” of vinyasa and power yoga, as well as sports. In Yin Yoga we hold poses in stillness for 1-5 minutes as we target the connective tissues such as ligaments, tendons and fascia; and we work into the major joints (hips and shoulders) of the body to increase mobility. This workshop is designed to reverse the effects of daily life, helping to improve your posture and energy levels. While holding the poses, we’ll work to calm the mind, relax the nervous system as we cultivate patience and positivity. This practice will also facilitate the digestive process following your Thanksgiving feast. This workshop is open to yogis of all levels including beginners. In this 2 hour workshop we will begin with a 30 minute Vinyasa Flow to generate a little heat in the body then we'll slow things down and move through a healing combination of Yin Yoga poses that will leave you feeling calm, balanced and refreshed. We will focus on seated and reclining poses throughout the workshop, offering a natural balance to the “Yang” of vinyasa and power yoga, as well as sports. In Yin Yoga we hold poses in stillness for 1-5 minutes as we target the connective tissues such as ligaments, tendons and fascia; and we work into the major joints (hips and shoulders) of the body to increase mobility. While holding the poses, we'll work to calm the mind, relax the nervous system as we cultivate patience and positivity. This workshop is designed to reverse the effects of daily life, helping to improve your posture and energy levels. Workshop instructed by Los Angeles based Yoga Instructor Ahmed Elaasar. Ahmed has featured in LA YOGA Magazine for his teaching skills. Join him as he brings these skills to Carmel. This 90 minute workshop will move through a healing combination of Restorative Yoga poses that will leave you feeling calm, balanced and refreshed. Not a sweaty experience. Restorative Yoga is the perfect supplement to your high intensity lifestyle. This is an opportunity to slow down, unwind and nourish yourself. We will use props (bolsters, straps and blocks) to support the body in posi ons of ease and comfort that facilitate relaxa on and health. Charlotte's #1 brewery yoga class featuring a variety of yoga instructors and studios each week at The Olde Mecklenburg Brewery! This week class will be lead by Ahmed Elaasar. Entry includes an Olde Meck brew. Cheers! Get Fit at the beach! Join Brett Beck and Ahmed Elaasar for a 45 minute Beach Bootcamp followed by a 45 minute Yin Yoga class. This is a donation based event to support St. Joseph's Center. Bring your smile, sunglasses, sunscreen, water bottle and a beach or yoga towel. See you on the beach Saturday morning! In this 2 hour workshop we will move through a healing combination of Yin and Restorative yoga poses that will leave you feeling calm, balanced and refreshed. We will focus on seated and reclining poses throughout the workshop, offering a natural balance to the “Yang” of vinyasa and power yoga, as well as sports. In Yin Yoga we hold poses in stillness for 1-5 minutes as we target the connective tissues such as ligaments, tendons and fascia; and we work into the major joints of the body to increase mobility. We will follow the Yin portion of the workshop with an easeful transition into Restorative Yoga, which is the perfect supplement to your high intensity lifestyle. This is an opportunity to slow down, unwind and nourish yourself. We will use props (bolsters, straps and blocks) to support the body in positions of ease and comfort that facilitate relaxation and health. This practice is designed to restore the nervous system and help release deeply held tensions from the body. Each pose is held for 5-10 minutes. This calming, nurturing workshop promotes the effects of conscious relaxation and is particularly beneficial for coping with sore muscles, insomnia, headaches, fatigue and an overstimulated nervous system. Advance registration and full payment is required to secure your place. **All payments are non-refundable within one week of the start date of the course… earlier than one week we will refund 80% of the payment but retain a 20% administration fee. Low-income families with children are in need of diapers (sizes 3-5) and Baby Wipes so you can bring these item in addition to, or in lieu of, a cash donation. Brett Beck, a certified personal trainer, will lead a fun, yet challenging bootcamp on the beach including kettle bells, ropes, TRX and more. 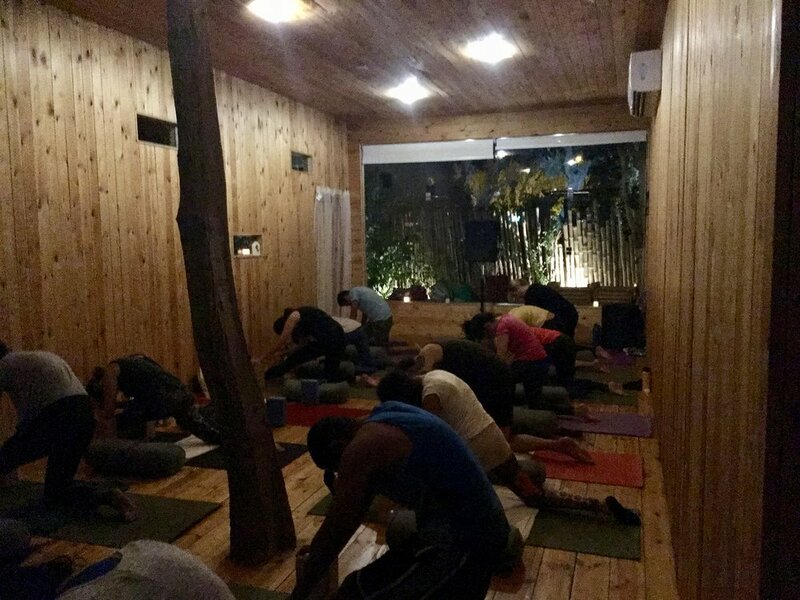 Following the bootcamp Ahmed Elaasar, RYT-200, will guide a yin yoga practice that will help speed your recovery and over time it leads to increased range of motion and greater flexibility which reduces the likelihood of injuries. Yin yoga is rapidly increasing in popularity among professional athletes and weekend warriors alike as they've experienced the benefits first hand. Come and try it out and leave feeling ready to rock the rest of your weekend! For those that would like to stick around we'll build community by gathering at a local restaurant for healthy beverages and food. Group size is limited so be sure to reserve your spot here on Eventbrite. This is a donation based event, donate through Eventbrite or bring cash day of the event. Do you like yoga? Do you enjoy food? Welcome to the “Breakfast Edition” of Yoga Kitchen. Join us in an inspiring environment and treat your body and mind to a healthy and tasty experience. The morning begins with me leading a Vinyasa Flow Yoga class that will leave you feeling energized, balanced and ready to take on the day. Afterward, Dori Lancaster (http:healingthrufood.com/), a nutrition educator and food psychology coach, will preparedelicious smoothie bowls with nice cream (bananas) to enjoy together. We look forward to meeting you in Marina Del Rey soon! Do you like yoga? If you're checking out my website I'm gonna go out on a limb and say yes. Do you enjoy food? Who doesn't!?! Join us on February 23rd 7-9pm at MatterMaker in Santa Monica and treat your body and mind to a healthy and tasty experience. I'll kick off the evening with a sweet a Yin Yoga class, then MB Boissonnault will prepare some delicious vegan dishes to share and enjoy together. We look forward to seeing you there! Message me for more details on how you can reserve your spot. Join me in Santa Monica for a FREE Yin Yoga Class on the 3rd Street Promenade at Athleta.